Meeting at the Masonic Hall, North Parade, Frome BA11 1AU. 18.30 0n the last Thursday of February (Installation), April, May and October. The Lodge has 30 subscribing members. There were a good number of Mark Master Masons present this evening to see Richard Dredge make an excellent job of installing his successor Patrick Haxell into the Chair of this old Mark Lodge. Richard has enjoyed two very successful years as Master and will be appointed Provincial Registrar at the Provincial meeting on Saturday 5th May 2018, a well deserved honour. Barrie Baker, the Provincial Senior Grand Warden was the principal guest representing the Right Worshipful Provincial Grand Master. He was his larger than life self, much to the amusement and pleasure of the brethren! He was accompanied by Steve McNaughton Provincial ADC. The meeting was followed by an excellent meal where the usual toasts were observed. Left to Right - Chris Brook - Senior Warden, Barrie Baker - Provincial Senior Grand Warden, Patrick Haxell - Master, Matt Williams - Junior Warden and Steve Mc Naughton - Provincial ADC. There were thirty two Mark Master Masons present this evening to see David Smith make an excellent job of installing his successor Richard Dredge into the Chair of this old Mark Lodge. Michael Condick, the Provincial Junior Grand Warden was the principal guest representing the Right Worshipful Provincial Grand Master. The meeting was followed by an excellent meal where the usual toasts were observed. Richard Dredge made a presentation to the caterers Gail and Peter from Orchard Leigh GC, thanking them for their excellent service over the past couple of years. This was the last meeting at Frome when they would provide the catering. The new Master has chosen the Alzheimers Society as his charity for the year. Left to Right - Tony Guthrie - Provincial Assistant DC, Patrick Haxall - Senior Warden, Richard Dredge - Master, Chris Brooke - Junior Warden, Mike Condick - Provincial Junior Warden and David Lyons - Lodge DC. 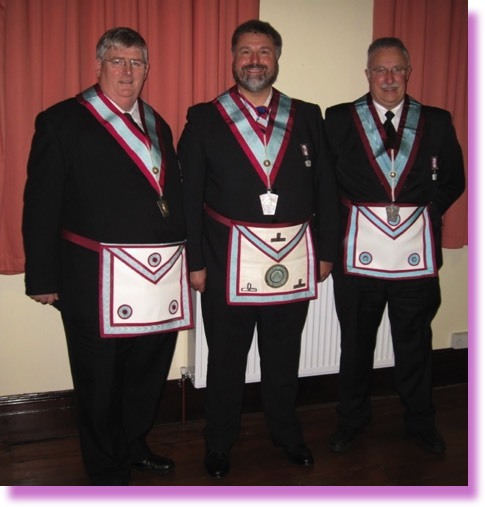 Installation meeting 27th February 2013. W Bro Roger Penny installed his successor Richard Conneely in his usual confident manner. V.W.Bro Cliff Hannabuss represented the Provincial Grand Master. Proposals were approved by the brethren during the meeting to give £550 to the Alzheimer's Society and £100 to the Province to help with the production costs of the Triangle Magazine. The £650 having been raised by the brethren during Clive Lambert's year in the Chair. It was further proposed and approved that £470 be donated to Bath Royal United Charitable Trust for the specific purchase of a Welch Allyn Vital Signs Monitor. This amount was raised by the brethren during Roger Penny's year in the Chair. Roger also presented a cheque for a further £365, towards the cost of the machine, that being the profit from his very successful "Curry Night" held last year. The Provincial Grand Master had agreed to make a donation from Provincial Charity funds of £251to enable the purchase. In the photo l to r V.W.Bro Cliff Hannabuss, David Smith - Junior Warden, Richard Conneely - Master, Roger Evans - Senior Warden. Installation meeting 23rd February 2012. W Bro Clive Lambert made a first class job of installing his successor Roger Penny. Both were playing to a full house, in addition to the members of Portal there was a delegation from St Andrew's Mark Lodge headed by the Master Tony Guthrie, Roger is treasurer of St.Andrew's There were members from Roger's Craft Lodges including the Master of Abbey Lodge, W.Bro Arthur Forse supported by members of the Lodge. Also in goodly number were members of Somerset Fairway Lodge including Bro Steve Williams who's jolly japes at the festive board kept everyone amused! It was a splendid evening followed by the usual toasts at the festive board. In the photo l to r Richard Conneely - Senior Warden, proud Master - Roger Penny and Junior Warden Roger Evans. Installation meeting 24th February 2011. W Bro Alan Thompson installed his successor Clive Lambert under the watchful eye of the Provincial Senior Warden Neil Hawes. At the meeting the Lodge remembered two very dear members who had passed to the Grand Lodge above. Our Chaplain Bro Hilary Daniel gave moving ulagies to Bros Doug Merritt and Ken Rossiter. Also at the meeting donations were given to The PGM charity appeal. £500 and a £500 plus cheque was given to Brest Cancer research. These charities were selected by our IPM W Bro Alan Thompson.It was a very good evening enjoyed by all who attended. In the photo l to r Neil Hawes Provincial JW, Ray Conneely JW, Master Clive Lambert, Roger Penny SW, Installing aster Alan Thompson and Provincial ADC Mark Golding. Provincial visit to Portal. The Provincial Grand Master and his team make a special visit to Portal Mark Lodge to dedicate the new Lodge Banner. 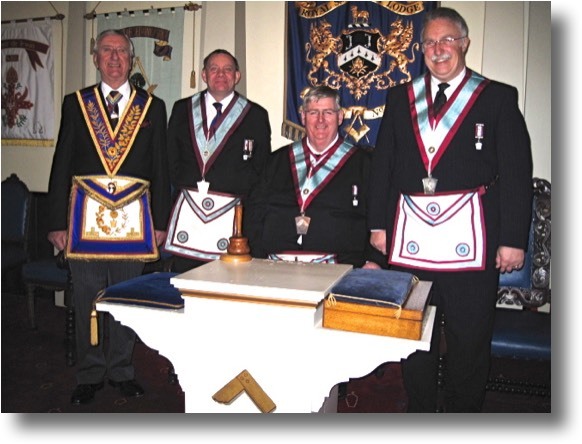 This was not the first public outing for the banner, the Provincial meeting in May 2010 was held under the new banner of Portal Mark Lodge. The idea for the new banner came from W.Bro Alex Carter, he can be seen supporting the banner in the photograph, to his left is the Provincial Chaplain, Vernon Harding and the PGM and Master of Portal, Alan Thompson to the right of the banner. It was a truly excellent Mark evening, the ceremony of the banner dedication with an excellent oration by the Provincial Chaplain was followed by a first class explanation of the Lecture on the degree by Alex Carter, Mike Stratton, Ray Conneely and Richard Conneely. PDF of the Oration given by W.Bo Vernon Harding. At the end of the ceremony the Deputy PGM Ray Guthrie addressed the brethren to say how pleased we all were to see him back and looking so well after his recent heart surgery. he went on to say that the surgery had prevented the PGM being present at the Mark v Craft bowls match and the Provincial Golf Challenge. The Mark teams had been victorious in both these events and the Deputy presented the PGM with both trophies. April 2010 - meeting and appeal donation. 55 Mark Master Masons were present to see Patrick Haxell advanced into the Mark degree, it was an excellent ceremony by the Master and his officers, followed by a very congenial festive board. The photo shows the senior officers of the Lodge - Senior Warden - Clive Lambert, Master - Alan Thompson and Junior - Warden Roger Penny. Thursday 29th April 2010. W.Bro Alex Carter presents a cheque for £500 to the Provincial Grand Master for his appeal. The money was half of the amount raised during Alex's recent year in the Chair of Portal Mark Lodge. The other half was donated to another charity, Dorothy House. Links to other Portal articles.